Identification: This is a small species with low parapodia that end well before the tip of the foot. The body and parapodia range from bright green to mottled green and white with occasional faint blue flecks. There are small, widely scattered papillae on the parapodia. Natural history: Elysia pusilla may well be the most common plakobranchid found in Hawaiian waters however it's seldom seen by divers since it rarely leaves its host algae (on which it's superbly camouflaged). It feeds on various species of the green algae Halimeda and may be found on Halimeda discoidea and Halimeda opuntia growing in moderately protected to highly exposed rocky habitats as well as in Halimeda kanaloana beds in deeper, sandy habitats. We've recorded it from depths of < 1 to 12 m (< 3 to 39 ft). 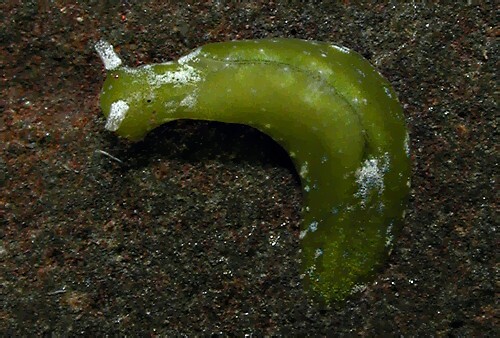 Mature animals are diurnally active and resting animals assume a highly flattened posture with the parapodia tightly appressed to the host algae. Rarely, they will secrete a milky fluid when disturbed. Egg masses are tightly coiled, flattened, yellow spirals. The eggs are closely associated with a reticulated mass of opaque-cream extra-capsular yolk. The eggs hatch in about 6 days in the laboratory and the extra-capsular yolk disappears during development suggesting that its role is primarily nutritional. Distribution: Maui, Oahu, Kauai and French Frigate Shoals: widely distributed in the Indo-Pacific; also in the eastern Pacific. Taxonomic notes: This is the species listed as Elysia halimedae MacNae, 1954 in Kay, 1979. Some authors list it as Elysiella pusilla. The name means weak or little. Photo: CP: 8 mm: Maalaea Bay, Maui; May 4, 2006.